This is the power of the iPhone. These new users, of which I am one, are not all coming to Eventful through its popular Web site, which helps more than six million people discover, share, and create events from concerts to dog shows. They’re signing up for Eventful because of the iPhone. “This is what happens when you offer mobile,” Dear said in a discussion with last100. By the end of last week, Apple had not provided Dear with specific numbers on Eventful downloads, although the app has consistently ranked among the favorites downloaded by users. In many respects, the number doesn’t matter. 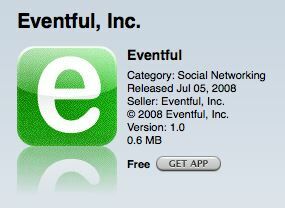 The decision to keep developing Eventful for the iPhone has already been made. “Absolutely we are going to evolve it,” Dear said. Of all the programs I’ve downloaded and fiddled with, Eventful is one I use nearly everyday. And it’s a far-from-perfect app, as many people point out in App Store ratings. Even so, Eventful demonstrates the power and promise of the iPhone platform because it integrates digital technology into my lifestyle in a fun and productive manner. 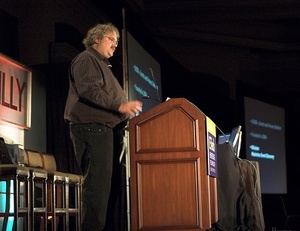 Dear, who lives in San Diego, spoke with last100 about developing the application for the iPhone, the challenges he and his team faced, the shortcomings of the Eventful app, and future plans. “It was by far the most fun software development project I’ve done in years,” Dear said. Apple released the first software developers kit (SDK) in the spring, leaving Dear and third-party developers worldwide scrambling. There was very little time to actually plan the Eventful app as coding began in May and debugging, compiling, and prepping the program for sale in the App Store happened in June and early July. It shows. While the interface is clean and well organized, it takes a bit of time to get the application to work for you the way you want it. It’s not as easy as it should be to find and track performers and venues you are interested in, especially when you go local over national. Toggling between cities is a pain. But Dear is aware of the shortcomings and plans to evolve Eventful on the iPhone into more of a true mobile application, not just a desktop program or Web service ported to the portable device. While there are hundreds of programs now available in the App Store, few handle the massive amounts of data mined by Eventful. Dear’s challenge was to break down Eventful to its core features and somehow shoehorn everything into a relatively small device like the iPhone. What information do people need to see? How do they want to see it? How do they search Eventful databases, what is returned, how is it presented? Additionally, Dear quickly discovered that mobile behavior is radically different than sitting behind a computer accessing the Web site over lunch. Impromptu behavior and spontaneity became important design elements. All third-party application developers for the iPhone had to compromise. They simply didn’t have the time, or the SDK wouldn’t allow for it, to include every feature and function they thought should be in their app. Eventful is no different. Dear wanted the app to seamlessly integrate with the iPhone’s calendar. You’re interested in an event, it should automatically show up on the iPhone’s calendar. It doesn’t because Apple has yet to open up the conduit between third-party apps and the calendar program, although this is expected to become available over time. Dear also wanted Eventful to use Google Maps inside the application, which also isn’t possible at this time. Click on a location link and you’re taken directly to Google Maps and away from Eventful. Even with the shortcomings, Dear said, developers are more or less pleased with the experience of writing apps for the iPhone. Just because Dear has had success with Eventful on the iPhone, it doesn’t mean that he and his team will be writing the app for Google’s mobile operating system Android anytime soon. When Dear, a prolific blogger, founded Eventful in January 2004, there was no Web service that helped him find events in the San Diego area. He was tired of learning about events after the fact. So he started a company with more than a Web service in mind. “We want to build a whole ecosystem,” Dear said. The Web service was one dimension. A mobile device — what eventually became the iPhone — is another. The use of event data collected and made available through an API is also part of the strategy. 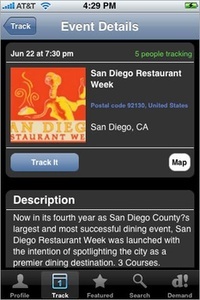 In fact, the iPhone app Where is powered by Eventful through a syndication deal.